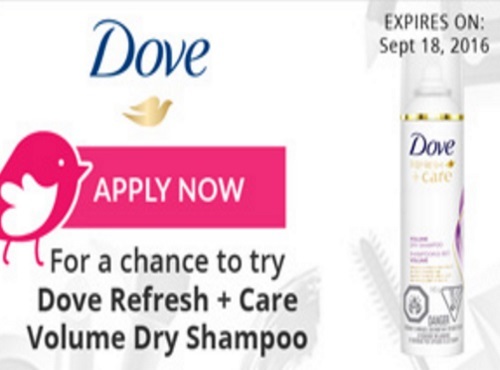 Apply to be one of 400 Canadian ChickAdvisor members to receive a Free Dove Refresh + Care Volume Dry Shampoo and report back with your review! Selected testers will be contacted by email during the week of September 19, 2016. Please allow up to 3 weeks for delivery of your dry shampoo. For extra consideration, help spread the word about this opportunity on social media! Don’t forget to include #DoveDryShampoo when you post on Facebook, Twitter, Pinterest or Instagram. Not a Chickadvisor member yet? Click here to join their Product Review Club. Please note, for your best chances to get chosen for campaigns, write at least 5 reviews for products that you have personally used.